Through Early Day Motion 47, the Energy Bill Revolution is campaigning in Parliament for new legislation to pay for a national programme of home energy efficiency retrofits, out of the money the government receives from carbon taxes. 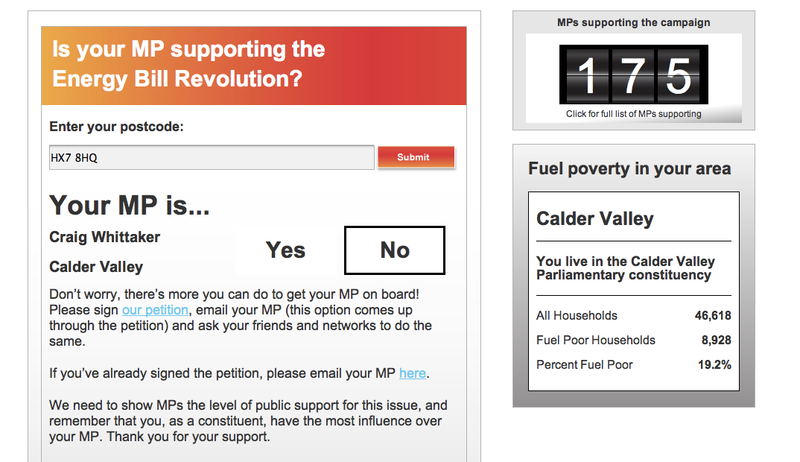 Craig Whittaker MP has not signed the EDM, despite being asked and despite the horrifying fact that out of the 46,618 households in Calderdale, 8,928 or 19.2% are living in fuel poverty. He replied to my request that he should sign the EDM to support the Energy Bill Revolution, saying he’s confident the Green Deal will reduce fuel poverty. Despite the evidence that this won’t happen. Please write to Craig Whittaker MP asking him to sign the EDM in order to offer a way out of fuel poverty for his constituents, and to help reduce carbon emissions and demand for energy. You can email him here. If you would like to organise a public meeting in support of the Energy Bill Revolution campaign, you can find a resource pack here. Fuel poverty affects around a quarter of UK households, and it kills and damages the health of vulnerable members of society, including children, older people and people with disabilities. Fuel poverty makes conditions like asthma worse, and people are more likely to have strokes and heart attacks. Illnesses caused by cold homes cost the NHS nearly one billion pounds each year. 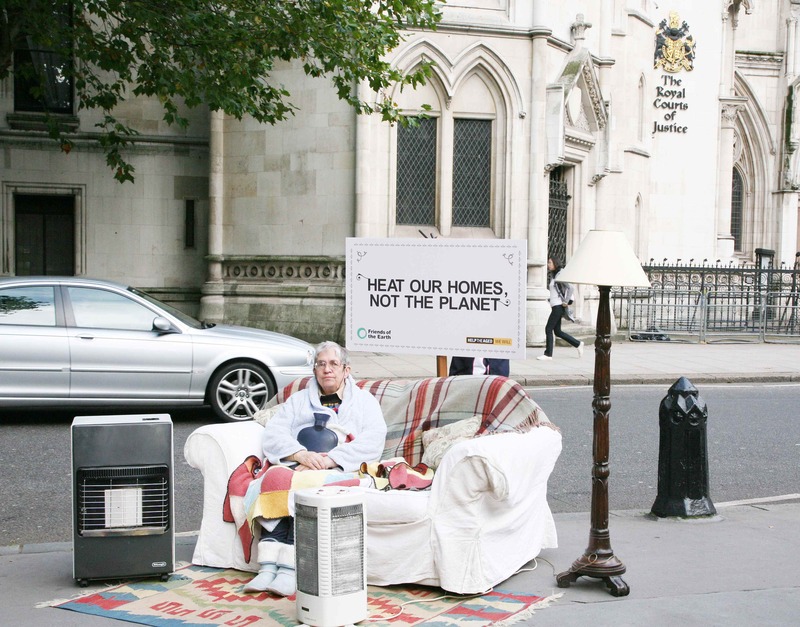 And on average, at least 7,800 people in the UK die every year from living in cold homes – more than four times the number of people who die on British roads. There is a way to solve the problem – use the income from the carbon taxes to pay for a national home energy efficiency retrofit programme. There are two main carbon taxes: the European Emissions Trading Scheme and the Carbon Floor Price. “From next year the Government will be collecting over £2 billion in carbon tax every year, rising to £4 billion by 2020 and £7 billion by 2027. Typical measures that could be installed to make a home more energy efficient include: loft insulation; cavity wall insulation; solid wall insulation; draught proofing; floor insulation; ventilation with heat recovery; insulated doors; heating controls; solar thermal for those with a south-facing roof; double or triple glazing; heat pumps; condensing, high efficiency gas boilers and biomass boilers. There will be enough money from the carbon taxes to pay for about £6.5K worth of energy efficiency retrofits for each UK household. Such “power down” makes decarbonisation of the national energy supply more feasible, through a switch to renewables rather than carrying on with coal, gas and nuclear energy generation. A recent study by the economic consultancy Cambridge Econometrics found that using carbon tax in this way could create more jobs and growth than any comparable Government spending programme or tax break. About 37% of all the UK’s greenhouse gas emissions come from non-industrial buildings and about 25% of the UK’s greenhouse gas emissions come from homes. The Government has two main energy efficiency policies, the Green Deal and the Energy Company Obligation (ECO). Unfortunately, without greater support, they will fail to reduce carbon emissions at the scale required. The Government needs to find additional carbon savings from buildings which are up to four times as great as the carbon savings projected to come from the Green Deal and ECO combined. Unless the Government offers households greater financial assistance, they are likely to miss their climate change targets. This entry was posted in Do something!, Energy and tagged Calderdale, carbon taxes, Craig Whittaker MP, Early Day Motion 47, Energy BIll Revolution, fuel poverty, home energy efficiency retrofit programme by jenny. Bookmark the permalink.